Although she is more famously known as the First Lady of the United States, Martha Washington led a rather private life. She played her part as First Lady and hostess well; as she knew that her actions would influence the role other presidents’ wives would come to accept. Not much is known about Martha’s childhood, so when it comes to her influences towards her beliefs on slavery it can be deducted that her beliefs are similar to those of slave owners in the same wealth bracket as her family. Her family was a member of the lower gentry, which means they were not the wealthiest, but they definitely were not the poorest. Her father owned a couple hundred acres and as many as twenty slaves. I believe that it is this upbringing that led to her viewpoint that slaves were an inferior group meant to serve. A common viewpoint of a farmer in a Virginia colony saw slavery as the backbone of a person’s wealth and social status as well as the backbone of the colonies’ overall economy; what the colonists had could not have been possible without the institution of slavery. It was through her marriage to Daniel Parke Custis that she herself came in control of slaves. 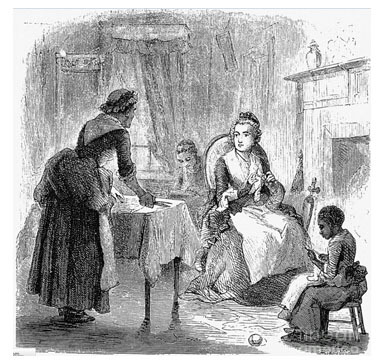 If she had married within her station, she would have had to handle household duties on her own, but because her marriage raised her societal status, she was in charge of twelve slaves to handle the household chores. Upon Custis’ death, Martha received 1/3rd of his slaves to use throughout her life. Upon her death, these slaves would be given back to the couple’s children. At some point in her history of slave ownership, she gained the reputation of being a fair mistress, yet never let them forget who was in charge by always threatening the slaves of being sold or punished if they displeased her. It is noted though, that both George and Martha always gave punishment equal to the misdemeanor. Although Martha had a reputation of being fair, Abigail Adams commented that Martha Washington was not as enlightened as she was on the issue of slavery and never let her slaves learn how to read and write. There were only a few accounts that I could find that had to deal with her actions and slavery. The first was in 1790 during the Washington’s time in Pennsylvania during the presidency. The state had passed a law that any slave residing within Pennsylvania for a full, straight six months would automatically be set free. Since George and Martha were not inclined to lose any slaves, they thought of situations to get their slaves back to the plantation in Mount Vernon just before reaching their six month date of freedom. The second action Martha took towards slavery was when her personal slave Oney Judge escaped. The Washington’s tracked her to New Hampshire where she had started a new life. Two attempts were made to bring Oney back to Mount Vernon but she refused each attempt. It is important to realize that because of Martha’s belief that slavery was normal and perfectly acceptable, she could not fathom why Oney would run away. If Martha was known to be a fair mistress then why would Oney Judge have decided to run away? Martha claims that Oney must have been seduced by a Frenchman for she was always well treated. The Washington’s also believed that nothing was done to provoke Oney to run away which was not entirely true. During Oney’s time in Philadelphia she befriended free blacks. I believe it was this friendship that helped open her eyes to what her life could be if she were to be considered “free”. So when Martha informed her that she would be given to Elizabeth Custis (Martha’s eldest granddaughter) as a wedding gift, Oney decided to run away rather than continue to be passed from owner to owner with no say in her future. Therefore, it was not that she was ill treated as a slave but her thirst for freedom that led her to run away. During one of the Washington’s attempts to recapture Oney, Oney had agreed that she would return to the Washington’s if she would be granted freedom upon their death. The Washington’s would not accept this negotiation which lead Oney to live the rest of her life as a fugitive. Within George Washington’s will, he wrote that the 160 slaves he owned upon his death would eventually be freed upon Martha’s death. The only reason Martha freed these slaves early was because of the fact that mysterious fires were being set on the plantation and it was believed to be a threat to keep these dissatisfied slaves around. Throughout her life, Martha only owned one slave outright by herself and it was left in her will that he would be given to her grandson, George Washington Parke Custis. I believe that it was due to her never wavering full support of slavery (even amongst her time in the North among abolitionists and anti-slavery movements) that she never tried to free the slaves on her own will. Upon Martha’s death, the remaining Custis slaves were distributed among her grandchildren even though it meant splitting up families; something George Washington tried to avoid upon his death. This image shows Martha knitting while her slaves sewed and cut cloth. This image is important because she never went anywhere without at least one of her personal maids, Oney Judge or Molly. Martha trained these slaves herself as seamstresses to care for her personal articles of clothing. This also represents the close contact Martha Washington had with her household slaves. “Martha Washington & Slavery.” George Washington’s Mount Vernon. N.p., n.d. Web. 24 Feb. 2015. <http://www.mountvernon.org/george-washington/martha-washington/martha-washington-slavery/&gt;. “Miller Center.” American President: Martha Washington. N.p., n.d. Web. 24 Feb. 2015. <http://millercenter.org/president/washington/essays/firstlady&gt;. “Martha Washington.” Omeka RSS. N.p., n.d. Web. 24 Feb. 2015. <http://marthawashington.us/exhibits/show/martha-washington–a-life/the-1790s/slavery&gt;. “To George Washington from Tobias Lear, 24 April 1791,” Founders Online, National Archives (http://founders.archives.gov/documents/Washington/05-08-02-0099 [last update: 2015-02-20]). Source: The Papers of George Washington, Presidential Series, vol. 8, 22 March 1791 – 22 September 1791, ed. Mark A. Mastromarino. Charlottesville: University Press of Virginia, 1999, pp. 129–134. Morgan, Philip D. ““To Get Quit Of Negroes”: George Washington And Slavery.” Journal Of American Studies 39.3 (2005): 403-429. E-Journals. Web. 24 Feb. 2015. 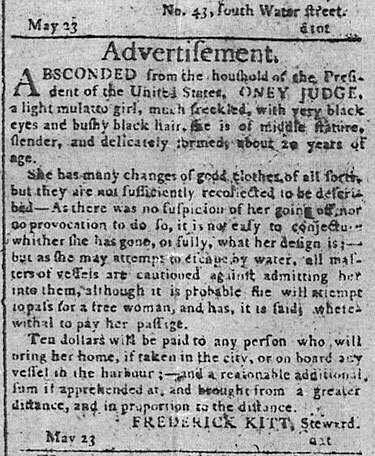 “Oney Judge.” Ushistory.org. Independence Hall Association, n.d. Web. 30 Mar. 2015. <http://www.ushistory.org/presidentshouse/slaves/oney.htm&gt;.